The builder's jewel: or, the youth's instructor, and workman's remembrancer. Explaining short and easy rules, made familiar to the meanest capacity, for drawing and working, 1. The five orders of columns entire...II. Block and cantaliver cornices, rustick quoins...truss'd partitions, girders, roofs, and domes. With a section of the dome of St. Paul’s, London. London, Printed for R.Ware, 1746. 2nd edn. Second edition of a widely-used book, which was still being reprinted as late as 1805. It deals with structural matters, such as the sizing of beams in trussed floors, partitions and roofs (of which several designs are illustrated), as well as the geometrical problems of the setting out of framing. 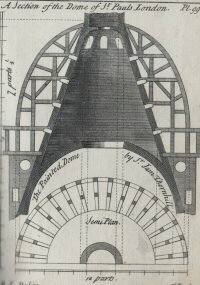 The book also contains designs for queen-post trusses, then a novel form of roof construction. Issued in "a fit size for the pocket", it was no doubt intended for use on site. Very small 4to. 34 + (2)pp, engraved frontis and 99 engraved plates. Contemporary full sheep, rebacked. Harris & Savage No.432.